This hand-crafted Wooden Casino Style Crap Table is made of durable Mahogany color wood (other stains are available). 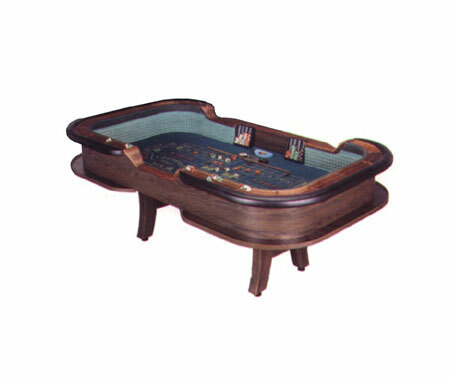 The Craps Table features H-style wooden legs, a two-row routed wooden chip tray, a padded arm rest, a padded billiard cloth Craps layout, a rail rubber lined and mirrored interior, and more. With its high-quality construction and detail-rich craftsmanship, this premium U.S.-made Craps table makes an excellent addition to any game room. Three Crap Table sizes are available: 10 Foot, 12 Foot, and 14 Foot Length. For additional information on our Casino Crap Table with H-Style Legs, please contact us at 1-800-233-0828. You might also be interested in our Casino Craps table with Wood Slab Legs, and our of selection of Craps Supplies, including Razor Edge Precision Casino Dice.